Assembly - Preheat the oven to 350 F. Lightly grease a 9-inch springform pan and place onto a baking tray. For the crust, stir the coconut, sugar and flour together. Whisk the egg white until it is frothy and then stir this into the coconut. Press this into the bottom of the prepared pan (if you are finding it sticky, wet your fingers with water before pressing). Bake the crust for about 18 minutes, until lightly browned around the edges and then cool before filling. For the cheesecake, lower the oven temperature to 300 ?F. Beat the cream cheese until light and fluffy. Beat in the condensed milk, scraping the sides and bottom of the bowl well. Beat in the zest and vanilla, then on a lower speed; beat in each egg and the yolk one at a time. Still on low speed, beat in the lime juice. Pour this over the cooled crust and bake for about 40 minutes, until the outside of the cheesecake is set, but the centre still has a little jiggle to it. 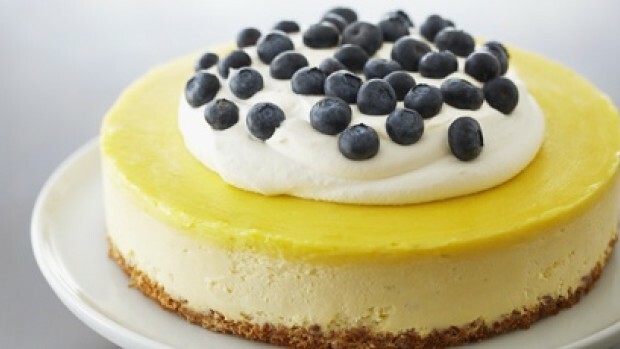 Prepare the lime curd as the cheesecake cools. For the curd, whisk the whole eggs, egg yolks, sugar, lime zest and juice in a metal bowl. Whisk in the butter and sour cream and place the bowl over a pot of gently simmering water, whisking often, until the lime curd has thickened, about 10 minutes. Strain the curd and spread this gently over the cheesecake. Once fully cooled to room temperature, chill the cheesecake for at least 6 hours (do not cover with plastic wrap). For the topping, whip the cream and skim milk powder to a soft peak. Stir in the sugar and vanilla and spread this over the cheesecake, leaving a 2-inches of the lime curd visible around the outside. Top the cream with blueberries and chill until ready to serve. 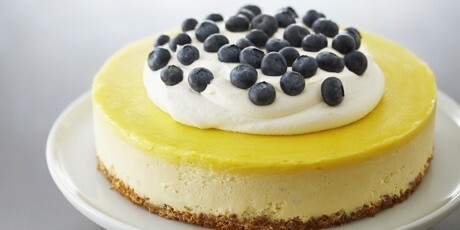 The cheesecake will keep, refrigerated, for up to 3 days.